Can Blockchain Technology Protect Us From Counterfeit Drugs? Pharmaceutical companies and supply chain consultants are exploring the use of blockchain technology to address a law requiring an electronic, interoperable system to trace prescription drugs through the U.S. supply chain. The Drug Supply Chain Security Act (DSCSA) was enacted by Congress in November 2013 to enable the Food and Drug Administration to “protect consumers from exposure to drugs that may be counterfeit, stolen, contaminated, or otherwise harmful,” according to an FDA factsheet. Supply chain partners are required to meet various deadlines, including a serialization deadline in November 2018 and a traceability and interoperable data exchange deadline in 2023. Blockchain is a “continuously growing list of records, called blocks, which are linked and secured using cryptography,” Bob Celeste, founder of the Center for Supply Chain Studies, explained at an event hosted by the Institute of Electrical and Electronics Engineers Standards Association (IEEE-SA) at a traceability seminar Nov. 8. Data are managed by a peer-to-peer network without one central operator, and transactions are time-stamped and cannot be changed after the fact, making the data immutable, he said. 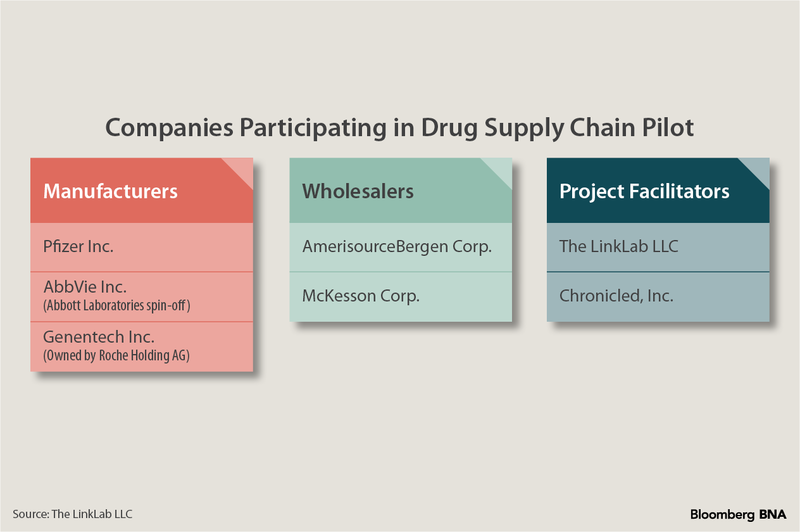 Pharmaceutical supply chain partners are engaged in pilot programs and a variety of studies to explore blockchain as a solution for DSCSA compliance. While there is an opportunity for companies to financially benefit from blockchain implementation, system functionality and compliance with the law likely depend on consistency and strategy unification among all key industry players, supply chain and technology experts told Bloomberg Law. Blockchain technology is also being explored and implemented in a variety of fields, such as in the food supply chain, in corporate governance record-keeping, and within other areas of health care. An FDA partnership with tech giant IBM was announced in January with an initiative to use blockchain to securely exchange patient data. A pilot program is allowing multiple big pharmaceutical companies to experiment with the technology to address the serialization requirements of the DSCSA. The MediLedger Project, announced in September, includes manufacturers Pfizer Inc., AbbVie Inc., and Genentech Inc. (part of Roche), along with wholesalers AmerisourceBergen Corp. and McKesson Corp. Two San Francisco-based companies, supply chain consulting group The LinkLab and technology company Chronicled, formed the phase one working group in the first quarter of 2017 after discussing with companies the “growing urgency” to find a solution to comply with the law, Susanne Somerville, The LinkLab’s co-founder and principal, told Bloomberg Law. The project facilitators are in the process of soliciting participation in 2018, she said. An initial challenge when developing a prototype where all industry players could participate together was creating a system to maintain both complete data privacy and the ability to verify the authenticity of transactions, Somerville said at the IEEE-SA event. The FDA is “aware that supply chain stakeholders and solution providers currently are evaluating whether blockchain technology would have a role in the enhanced interoperable, electronic drug distribution system for the year 2023,” an FDA spokeswoman told Bloomberg Law in an email. It is “too early to comment on the advantages and disadvantages of blockchain at this point,” she said. AmerisourceBergen, a program participant, is closely watching blockchain pilot programs in other industries, but has “not yet determined if/how it will pursue or implement blockchain technology,” the company’s vice president of corporate and investor relations, Keri Mattox, told Bloomberg Law in an email. While there is “promising” potential for innovation and drug verification and authentication, “consistency across data platforms across the industry will be key,” Mattox said. Regulators are likely not sure how to regulate the still-evolving technology and do not yet feel comfortable giving guidance to the industry, according to Joseph Guagliardo, a partner in Pepper Hamilton LLP’s Philadelphia and New York offices and of the firm’s blockchain practice. There is still a “long way to go” until the technology matures, Guagliardo told Bloomberg Law. Rather than waiting for FDA guidance, direction from “a valid organization that represents the industry” would benefit key trading players, according to Dirk Rodgers, regulatory strategist with traceability and serialization technology company Systech International and founder of supply chain blog RxTrace.com. The industry should agree on one or two common systems on which to exchange data, Rodgers told Bloomberg Law Nov. 6. Whether the solution is blockchain or another technology, it will be difficult for the industry to agree on a solution not specified in the regulation without guidance from an authority like the Healthcare Distribution Alliance (HDA) or an organization that is ad-hoc for the purpose of the DSCSA, he said. In order “to be interoperable, everybody has to do the same thing,” Rodgers said. Otherwise, companies will send and receive data on separate systems, and it will be difficult to share information, he said. Blockchain provides “a solution to a problem that may not be solvable by any other type of technology,” Guagliardo said. The database is able to track products and automatically distribute product location data to the players, eliminating the need for a central operator to update individual databases, he said. The data in the system are trusted, secure, immutable, and “most importantly, it’s shared,” he said. Companies can financially benefit from implementing blockchain to handle supply chain logistics by generating revenue through data exchange capabilities, reducing operational inefficiencies by sharing costs through partner collaboration, enhancing the recall process, and using data analytics to improve decisions and outcomes, Gordon Tampol, chief executive of iSolve, an East Norriton, Pa.-based company that uses blockchain technology to provide a “bridging solution” for health-care partners, said at the event. Speakers at the IEEE-SA event did not provide an answer to questions about the actual implementation and maintenance costs of the technology.Organizations need to be prepared for two sets of costs, which will differ by company based on individual business requirements, Tampol said. There will be costs associated with consulting, integration, and hardware when testing the concept and then when implementing the solution, he said. Results from an August survey signal that more companies are looking into blockchain initiatives than are announced publicly, but unanswered questions about the technology are likely holding companies back from using it, Maria Palombini, director of emerging communities and opportunities development at IEEE-SA told Bloomberg Law. An IEEE-SA survey of 300 U.S. supply chain executives found that more than 30 percent of pharmaceutical company respondents are either in proof of concept or pilot stages with blockchain initiatives, and the majority of respondents are exploring the idea of blockchain in some capacity, Palombini said. None of the companies surveyed will have partial or full implementation of a blockchain supply chain system in the next five years, though 80 percent indicated a “likelihood” of advancing to the next phase of implementation, such as moving from proof of concept to pilot, Palombini said at the IEEE event. Three remaining fundamental questions executives want addressed are who will pay for the technology, who owns the data, and how companies will obtain internal and external buy-in from each of the necessary partners in a supply chain, she said. While the technology will likely be part of the health-care ecosystem, “the question is to what extent and how quickly,” Sharon Klein, partner in Pepper Hamilton LLP’s health sciences department in Orange County, Calif., and leader of the firm’s technology and digital health practices, told Bloomberg Law. There is more promise on blockchain’s use in drug distribution than in other areas of health care because the supply chain does not involve individual patient protected health information, Klein said. The decentralized nature of blockchain is not how the regulatory structure of health care generally operates, in which there is a chain of command and any liability floats to the top level of an entity or to the government. Blockchain is “anti-chain of command,” she said.